How many times do you make a loved recipe, only to read you need 4 or 6 egg whites, but not their yolks?! Old fashioned buttercream, angel food cake, white cake, etc- they all call for the yummy whites, but not their yellow (and fatty) sidekicks! If you're like me this means you end up with a heck of a lot of lonely yolks leftover. But, if you're also like me, you can't bare to throw them away. What if you want to make a custard? Flan? Creme Brûlée? Or how about old fashioned ice cream?? You'll need those yolks and be so sad you tossed em. Besides, you paid good money for those Omega 3's! The trash is not the answer. 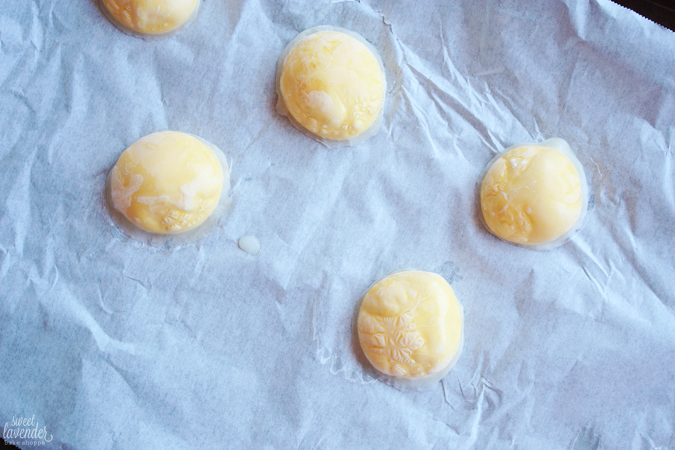 I've tried a few different ways of storing yolks. If you plan on using them within a few days, simply in the fridge works best, but does have its cons. Make sure to write down how many are in your air tight container, so you don't forget. Hopefully your recipe will need that exact amount because most likely some will break and turn into one giant amount of yolkiness. Have you ever tried measuring out the equivalent of one egg yolk? Sheesh. For longer term storage, the freezer is your best friend, but again- how do you freeze the yolks separately so that you can take out and defrost the exact amount you need for your next recipe? Sure some have tried ice cube molds and individual plastic baggies...not really for me. 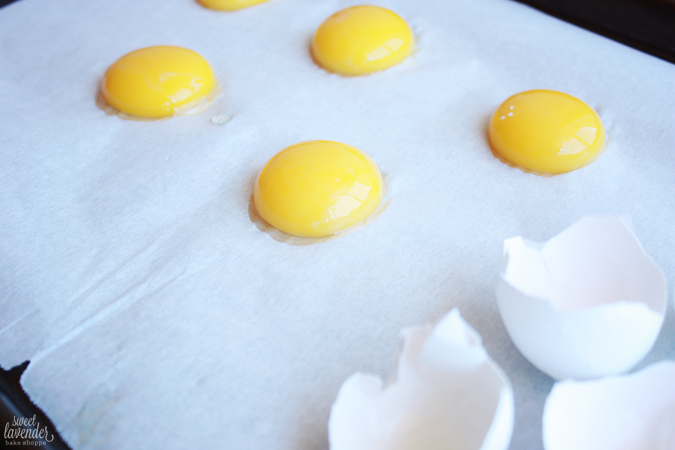 Enter this little trick I've learned: Gently placing each yolk on a baking sheet and freezing until hard. Works like a friggin charm. Then, when you're ready to cook or bake using them, you just remove the exact amount you need and defrost. 1. When you've got a recipe that's calling for whites only, get out a sheet pan (or two depending on how many whites you're using!) and line it with parchment paper, or even better- a silpat. Set aside. 2. Very gently crack your egg and separate the egg white from the yolk. You can do this by straining the whites through your fingers, reserving the yolk in your hand. Or you can do it by transferring whites back and forth between the egg's cracked shells until all the white has dropped into a bowl and you're left with the yolk in shell. 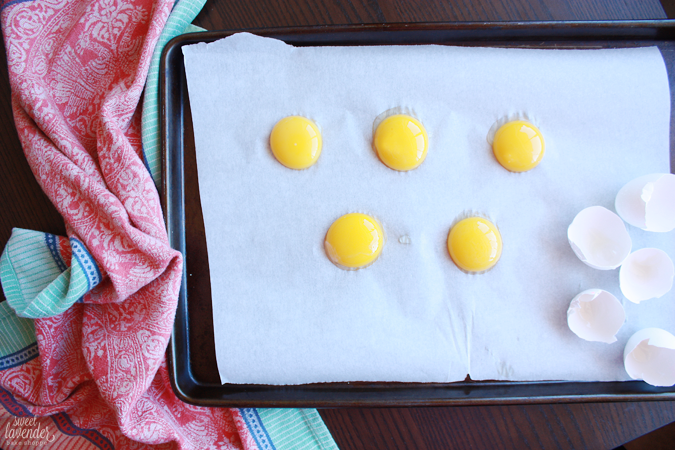 Once yolk has been separated, very carefully place onto your prepared sheet pan. Continue to do this until all the yolks have been placed on pan. You'll want to keep a few inches in between yolks in case they move around during transit. Don't want them to touch and fuse together. **If your yolk happens to break, no sweat. Just place it on it's own parchment lined plate or pan and freeze it alone, you'll count that still as "one egg yolk". 3. 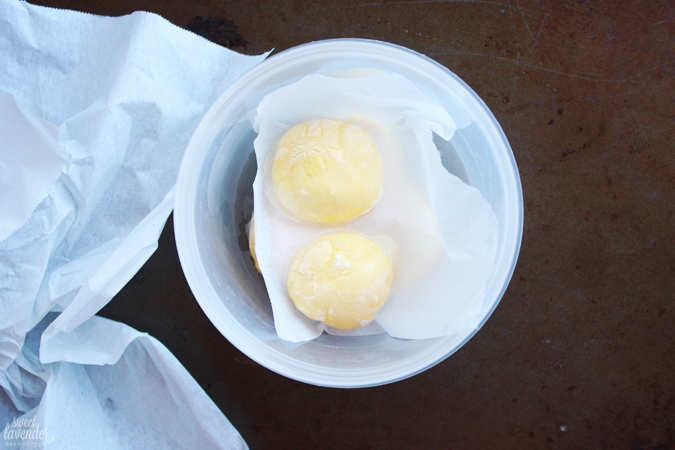 Place pan(s) carefully into the freezer, keeping pan flat, and freeze until egg yolks are completely frozen solid. This should take about 45 minutes to an hour. 4. 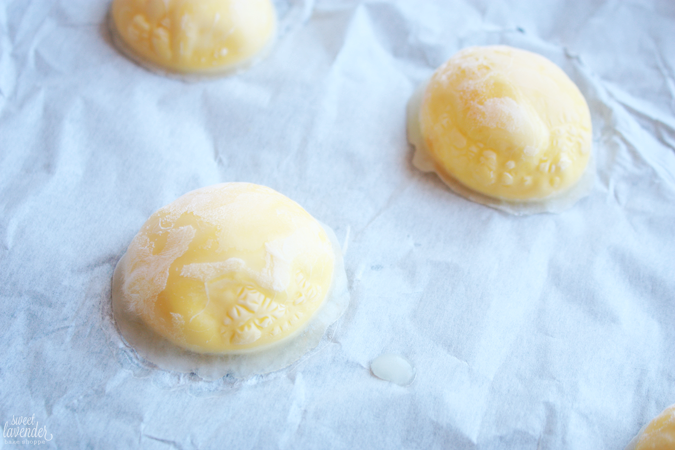 Once frozen solid, quickly remove yolks from the pan and place into a freezer proof air tight container. I placed a piece of parchment in between each layer of yolks, just to prevent them from sticking at all. 5. Close up container and onto a strip of masking tape mark the date and how many yolks are in the container. Place back into freezer and store for up to 6 months! 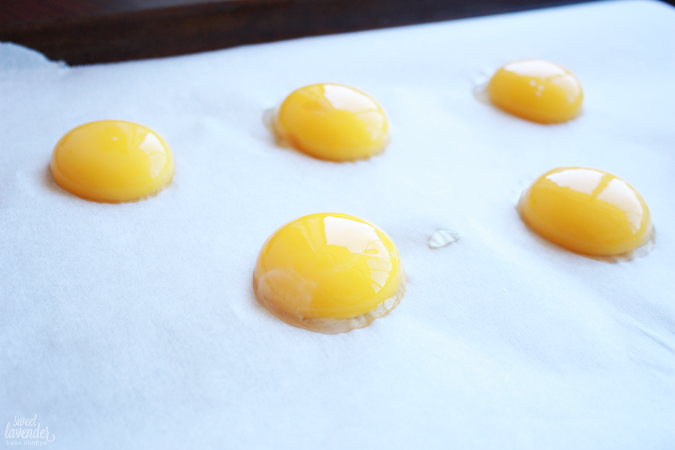 **Those broken yolks can also carefully be removed from the sheet pan and placed into a layer in your container, separated by more parchment. Keep very careful not to break them though, as they'll be a lot more fragile than the whole yolks! 6. When you're wanting to use your yolks, simply remove as many as you need for your recipe and allow to thaw overnight in the fridge in another air tight container. Then, use as you would fresh yolks! I had never even thought of trying to freeze them. What a great idea! Thanks! Genius! I always feel bad for wasting these, but I've never realized you could save them! Wow! You're not lying! I actually think I can make these!! Putting them on the list for this weekend baking! I'm so there with you.